Last reviewed by myself just a touch over two years ago (review), Jonathan Miller’s staging of Rossini’s comedic masterpiece returns now a round and full 30 years after its first outing. It has survived well, but perhaps over-familiarity now results in finding just a touch too many hints of Miller in G&S mode, as if Gilbert and Sullivan’s antics were sellotaped onto Rossini’s. The commedia dell’arte references still work well, but perhaps the slapstick that lasted so long is now wearing a little. The actual staging, with its carefully considered lighting, remains satisfying. Covent Garden’s fairytale interpretation by Moshe Leiser and Patrice Caurier (review) acts as a balance to this, Miller’s rather more open-air reading. There are a number of constants between this cast and the 2015 ENO outing: Figaro, Almaviva, Fiorello, Ambroglio, the official and the notary are all taken by the same singers. There was one big change, and a last-minute one, though: Alan Opie, who had been Figaro way back in 1987, was due to take on Bartolo (a role taken by the wonderful Andrew Shore in 2105). Instead, bass-baritone David Ireland got what appears to be his big career break. Ireland recently left the Guildhall and was appointed an ENO Harewood artist. His biography principally lists his activity over at the Guildhall, and I can do him no greater compliment than to state he lived the part. No concession had to be made whatsoever for indisposition, late notice and lack of experience. There was a lovely sense of simply being at home on the stage. Ireland’s voice is full, rounded and confident. With all this taken into consideration, it is only fitting he gets first consideration in this review. The Rosina, Sarah Tynan, was a brilliant assumption. Tynan has all the vocal flexibility required for the role, as well as a freshness both of voice and of demeanour. Morgan Pearce, the Figaro, has a huge voice and swagger to match, his “Largo al factotum” despatched with aplomb. Alastair Miles is a well-loved and familiar face at the Coliseum. His Basilio was a sight to behold, tall, lanky, uncoordinated and simply brilliant in “La Callunia”. Another familiar face is Yvonne Howard, superb in the small role of Berta. Eleazar Rodriguez seems more comfortable this time round as the Count Almaviva, almost as if she is slipping into a comfortable pair of old slippers. All of the smaller roles were well taken. The ENO Orchestra clearly has taken a liking to Hilary Griffiths – certainly if the well-shaped Overture was anything to go by. This was Griffiths’ ENO debut – he is most associated with opera houses of Prague and Cologne – and his clear sense of theatre ran through the evening. He also seems to think on the long-term: the music had direction. Perhaps an extra addition of fizz now and again would have allowed us to really live in the moment, but this was fine conducting indeed. After 30 years, one wonders how much time is left for this production? There were spare seats, and more post-interval. One fervently hopes, though, that Hilary Griffiths will be asked back and that we will see more of David Ireland. 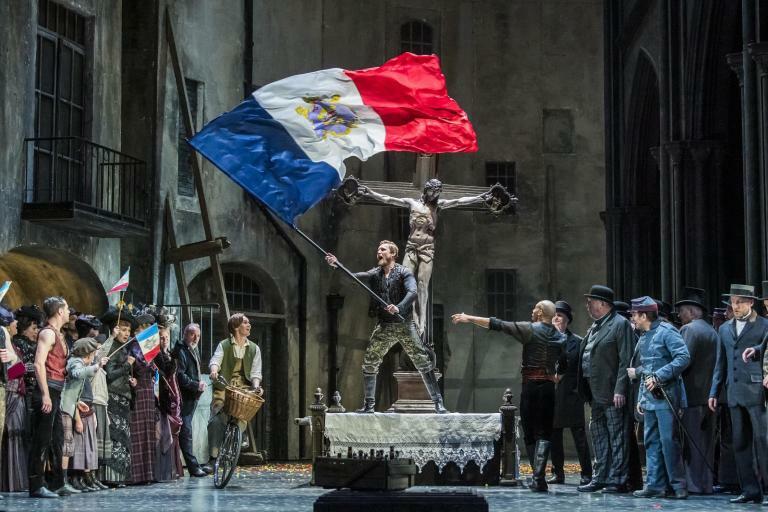 For more about English National Opera click here.